It's all still kind of a blur to Brandon Crawford. As he wiped the remnants of a shaving-cream pie from his face and uniform, he wasn't even sure which of his prankster teammates got him. Welcome to the big leagues, kid -- and how! Crawford hit a go-ahead grand slam in his first major league game, helping Tim Lincecum and the San Francisco Giants beat the Milwaukee Brewers 5-4 on Friday night. The focus of today's game at AT&T Park was not on the field, but instead all about the injury to the team's best player. "It was all unreal," Crawford said, recalling how he felt as he rounded the bases. "Awesome. I mean, I still kind of have the jitters about it." Lincecum (5-4) gave up three runs in seven innings. 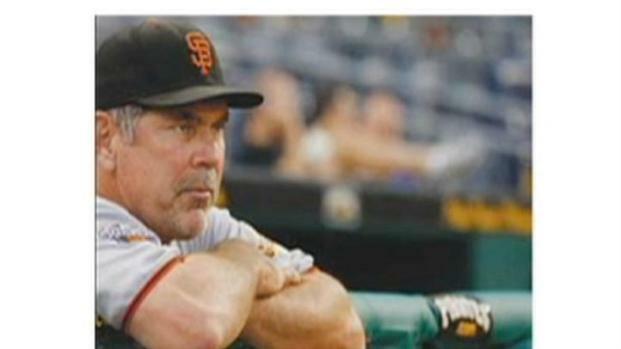 The Giants won despite the ejection of manager Bruce Bochy, who argued a close play at home plate in the fifth inning. Bochy admitted he might have lost his temper in part because it has been such a frustrating week for the Giants. The manager of the San Francisco Giants talks about the hit that appears to have cost the Giants the best player for the rest of the 2011 season. 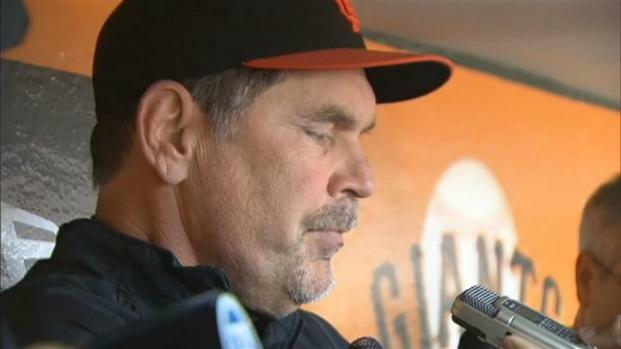 "I'll be honest, I couldn't really tell if he had the call right," Bochy said. "But there's frustration building up, with everybody." With the Brewers trying to rally in the eighth, Giants catcher Eli Whiteside absorbed a big hit from Prince Fielder. It was reminiscent of the play that caused a serious injury to Giants catcher Buster Posey earlier this week, but Whiteside held on to end the inning and preserve the lead. "You don't have any choice but to try to knock the ball loose," Fielder said. "But they made a great play." Posey, the reigning NL Rookie of the Year, likely is out for the season. His jersey hung by itself in a locker in the visitors' clubhouse Friday. Bochy stood by his assertion that baseball needs to make a rule to protect vulnerable catchers, but said Whiteside at least had time to catch the ball and brace for Fielder to run into him. "It's a little different," Bochy said. "He had the ball, so he could set up a little bit. A catcher's got a better chance than when he's in the process of trying to catch a ball. That's when he's really vulnerable. Still, it's a big guy bearing down on you. 'Whitey' did a great job." Brian Wilson pitched the ninth for his 14th save, striking out Rickie Weeks to end a potential rally. Weeks hit a two-run homer off Lincecum and Shaun Marcum (6-2) took the loss. Nyjer Morgan had a single and a double in his return from injury. But it wasn't enough to give the Brewers what would have been a franchise record-tying 10th straight victory at home. "It's a good run," Fielder said. "We just have to start another one." Until the seventh inning, it had been shaping up as another strong outing for Marcum, who has been the Brewers' best starter this season. The Giants finally got to him in the sixth when Freddy Sanchez singled home a run. A fan sitting in the front row near home plate then earned the crowd's ire when he appeared to interfere with what could have been an inning-ending foul popup. The fan was off the hook after Marcum got Pat Burrell to fly out. But Marcum got in trouble in the seventh, loading the bases. Making his major league debut with a start at shortstop, Crawford came to the plate with the Giants trailing by two runs. He pounded a pitch from Marcum over the fence, giving the Giants a 5-3 lead with his first hit as a major leaguer. "Very happy for the kid," Bochy said. "That's a debut he'll never forget." The 24-year-old Crawford had his contract purchased from the Giants' Class-A San Jose affiliate Thursday. He missed several weeks to start the season after breaking his finger in spring training. It was a boost to Lincecum, who didn't look quite as dominant Friday as he did in his last outing, a shutout against Oakland. Lincecum allowed six hits, striking out four with no walks.